Last week I took part in the last of a series of workshops on gender equality with representatives from different organizations around Nicaragua. The last evening I finally had a chance to see the Colectivo’s theatre group perform their feminist play ‘Ser como el aire quisiera´or in English, ‘I want to be like the air’. All of the plays the group performs are written by the actresses themselves in extensive consultation with the feminist movement and survivors of domestic violence. The group’s mission is to generate critical reflection on the subordinate status of women in society and in the process they hope to transform this reality. 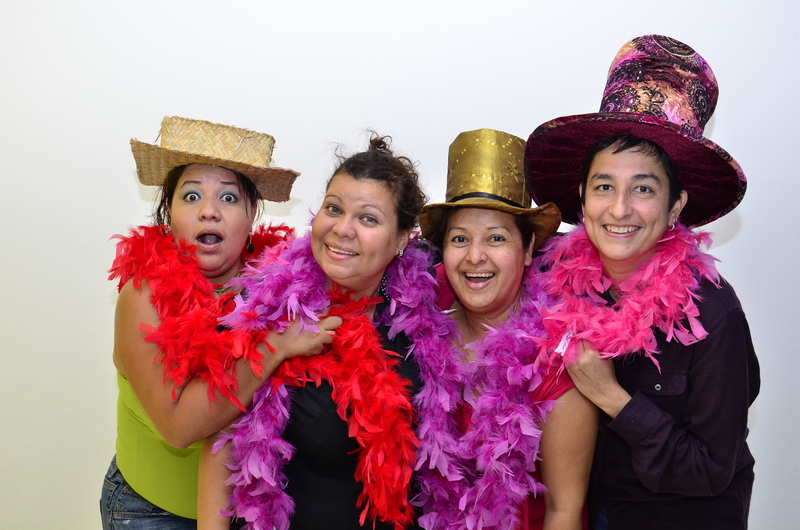 Actresses: Sandra Arceda, Migdalia Tórrez, Martha Meneses and Cristina Arévalo Contreras. ‘I want to be like the air’ focuses on a woman named Shante who is being abused by her husband. She comes into contact with three women at a studio, where they are rehearsing for their own play. She shares with them the story of her life, her dreams and her fears. Through the process all their lives are transformed. Shante spends most of the play with her leg attached to a stool, representing her captivity to her abuser and her own internalized sense of worthlessness and objectification. She feels as if she is just another piece of furniture in the house. The play unmasks the excuses many abused women make to defend their abusers and to justify the violence they are being subjected to. It makes you feel the difficulty victims face in admitting the abuse to close family and friends and even to their own selves. As the play continues, and with the help of the other characters, Shante confronts her situation and sees her husband for who he really is – a violent man who doesn’t deserve her love and who has no right to dominion over her body. She sees the freedom, joy and lightness in leaving him – in being like the air. She unties the rope binding her to the stool. She dances and sings and smiles. She is free. This play, and theatre more broadly, is a powerful way to explore gender discrimination and violence against women in a way that is accessible to a wide audience. ‘I want to be like the air’ balances the gravity of the issue of domestic abuse with humour and the musical elements of song and dance. It is sobering and entertaining, a difficult combination to achieve. It is hard to get men and boys interested in feminism and women’s rights. Many young women these days are also distancing themselves from the label ‘feminist’, believing the myth that the word signifies angry, man-hating, extremist, no fun activists. The arts is a creative tool to help people see that this is their issue too. If you believe in equality between men and women, you are a feminist. Feminism and the equality of the sexes belongs to all of us. The Colectivo theatre group has performed all over Nicaragua and in Honduras, Guatemala and El Salvador. I would love to see their show brought to the United States and Canada one day. Look, gentlemen judges. What I most want is my freedom. I want to laugh, write, read, shine, reach for the stars, fly. This entry was tagged Domestic violence, Nicaragua, theatre, violence against women, women's rights. Bookmark the permalink. ← Because of stories like this one.